In her new book, award-winning principal and leadership expert Cathie West provides education leaders at all levels with the tools and guidance they need to engage teachers in the process of increasing student achievement. With authentic examples and research highlights, readers learn how to develop a motivated faculty that is truly dedicated to school improvement and student success. The "e;S… ix Keys"e; covered in the book are both substantive and comprehensive and offer a clear path to success: Key 1: Create a Culture of Engagement Teacher engagement definition, attributes, and steps towards attainment Key 2: Get Organizationally Engaged Exemplary organization qualities, leadership styles, and effectiveness strategies Key 3: Engineer Engagement Quality meeting characteristics, engagement activities, and leadership techniques Key 4: Zero in on Best Practice Effective teaching attributes, instructional practices, and success tips Key 5: Tap into Teacher Leaders Teacher leader selection, training, and strategic deployment Key 6: Confront Change Challengers Challenger profiles, interventions, and support suggestions BONUS! Every chapter includes a wrap-up to help readers review, apply, and retain new learning for each of the six keys to teacher engagement: Key Concepts provides a bulleted summary of each theme's major concepts to help readers review key ideas. Best Strategies summarizes each chapter's high impact teacher engagement strategies. Steps to Success suggests activities that will move new concepts and skills into practice. NOTEWORTHY: This book is also an excellent resource for university and college instructors who are responsible for teacher and principal preparation. 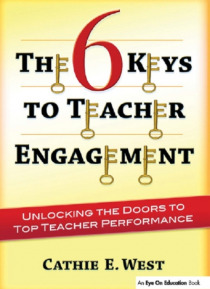 The 6 Keys to Teacher Engagement substantially supports graduate level courses pertaining to educational leadership, school improvement, curriculum and assessment, and professional development.